Whether they were getting ready to hit the runway at New York Fashion Week last month or prepping their skin to attend the wedding of Meghan and Harry last year—yes, really—there's one skincare brand that celebs swear by: 111SKIN. This past month has seen an influx of 111SKIN on social media, with some of the key celebrities we always follow for beauty advice sharing selfies complete with the brand's signature masks. A staple in the kits of top makeup artists like Pati Dubroff, and frequently spotted backstage at fashion week, these hydro-gel and bio-cellulose sheet masks are the ultimate quick fix when you want to get glowing skin fast. Keep scrolling to see which celebrities can't get enough of 111SKIN and what their go-to masks are. 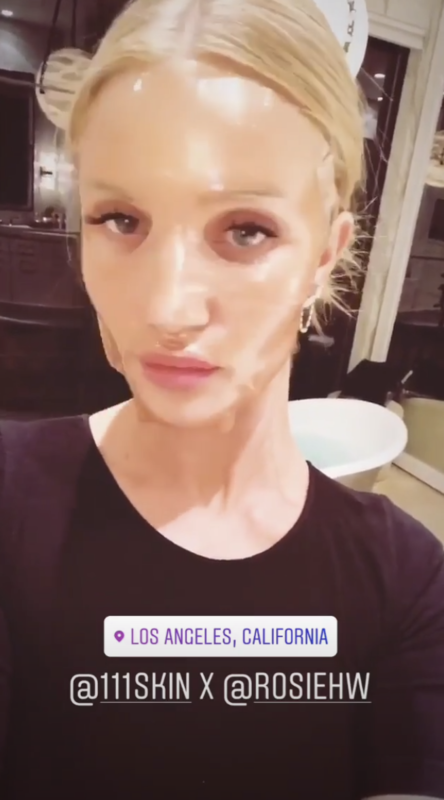 Rosie HW swears by the 111SKIN Rose Gold Brightening Facial Mask for big events, crediting makeup artist Pati Dubroff for getting her hooked on them. Make like Rosie and apply this to your skin while you're doing your hair to give the serum the most amount of time to sink in before you start on your makeup. To get Priyanka Chopra as glowy as possible ahead of the royal wedding of Meghan and Harry last year, Pati Dubroff cleansed her skin first with the 111SKIN Exfolactic Cleanser then applied the 111SKIN Rose Gold Brightening Facial Treatment Mask. So what exactly is it that makes this sheet mask so effective? Yannis Alexandrides, MD, 111SKIN founder, explained that it's all down to the "hydrogel technology the mask is made from." Inspired by Korean skincare technology, "Hydrogel is a natural polymer which acts as an adhesive barrier on the skin to allow the formula to be fully absorbed." Put simply, the texture of the sheet mask enables more of the brightening serum to work into your skin for more instantly visible results. I'm sold. Last month, 111SKIN was in the backstage kits at the Brandon Maxwell show at New York Fashion Week to help prep the model's skin. Makeup artist Top Pechaux used these cooling 111SKIN eye masks to reduce puffiness under Bella Hadid's eyes while prepping the rest of her makeup for the runway. Model Ashley Graham swears by the 111SKIN De-Puffing Eye Masks for keeping her skin calm ahead of big events. They're super fast working and soothe eyes in just 15 minutes. Pre-Oscars, Kim K took to Instagram to show off her skin prep in the form of this three-part mask from 111SKIN. Yes, it's pricey (would we expect anything less from Kim? ), but it targets your face, neck, and chest, so it's ideal if you want to get your skin looking plump and glowy before a big event. Up next, seven French women with particularly good skin on the products they swear by.